This 500 words on Leadership Development is for all leaders and managers are interested in learning about valuing their employees as well sustaining an effective and efficient organisation. As a young person entering the workforce, I have worked my fair share of front-line customer service. Whilst working these roles, I have experienced both extremes of management, from extremely competent to not-so-competent. One of the biggest factors in the formulation of these opinions was the level of respect and value given to me by the manager in question. In this 500 words publication, I will share some thoughts on respecting your front-line staff, and connecting these staff with top level management. In turn, this will inevitably result in an increase in customer satisfaction levels. Icebergs are a useful method of visualising many issues to do with the ‘unknown’. You may well be familiar with the famous leadership development iceberg model explaining the concept of competency and behaviours. The iceberg below, however, represents the key findings of a large study undertaken by Sidney Yoshida in 1989. 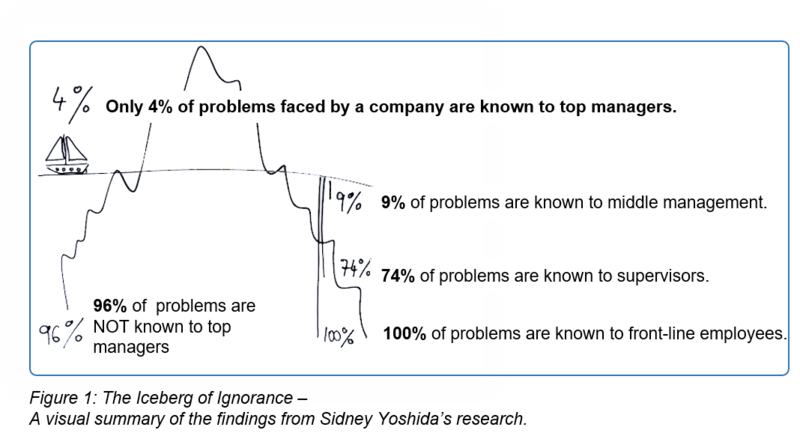 This ‘Iceberg of Ignorance’ shows the clear disconnect Yoshida found between managers and front-line employees, with top level management only knowing 4% of their companies’ problems. This disconnect is most present and prevalent in traditional, hierarchy-based companies, leading us a key issue we are facing; how do we flip this iceberg and optimise the effectiveness of hierarchical leadership? As idealistic as egalitarianism sounds, there are of course limitations. In fact, the reason hierarchical organisations have seen so much success is due to the simple fact that hierarchy works. Some people are not equipped or suited to take on the ‘emotional burden of making big decisions’ 2; leaders are required. Hierarchies are also vital in sustaining a working business model with set processes and the promotion of efficiency. The common misconception here would be to assume that flipping the iceberg means that the bottom rung of the organisation assume control of the company as they know about all the problems. This is far from the case. In most cases, a hierarchy is an essential aspect of a company. However, acting in a superior manner and not valuing your staff as they deserve is something that has no place in a modern business. By maintaining a hierarchy, a company retains order and structure. However, by acting in a traditional, ‘hierarchical’ manner, the top managers are ignorant of the majority of issues in the company. Therefore, companies should allow for and encourage the opening of feedback loops from the front lines all the way to the top management. This is how you flip the iceberg. Give the frontlines a platform and encouragement to feedback on issues without fear of repercussion or being ignored. There is a mind-set shift required for organisations; the most important people are the people who interact with the customers, not the ones who are highest on the hierarchical ladder. Leaders are therefore the ‘servants’ of their employees, and if this is effect is achieved, the employees will likely become more productive and valuable members of the company. Whilst helping companies with leadership development and shifting the mind-set of employees towards a flip of the iceberg, CLP is observing with amazement a contemporary ‘iceberg flip’ at one of its multinational and multi billion revenue clients. Despite facing extreme resistance, they are also seeing extreme progress as a direct results. This tells us that no one is too ‘big’, or ‘stuck in a system’ to begin a necessary iceberg flip. Rheen (2018) Breaking down the Corporate Hierarchy [online] http://donrheem.com/breaking-down-the-corporate-hierarchy/.